The Atlanta Falcons were off to a 2-3 start as they traveled to San Francisco to take on the 49ers on October 13, 1991. Coached by Jerry Glanville, the Falcons were coming off of eight consecutive losing seasons and had lost in their last five meetings with the 49ers. 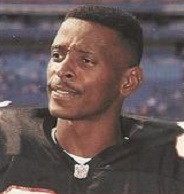 The club employed a run-and-shoot offense directed by talented but injury-prone QB Chris Miller (pictured at right) with WR Andre Rison as the leading receiver. The defense featured an outstanding cornerback tandem in Deion Sanders, who was also excellent at returning kicks, and Tim McKyer, a sixth-year veteran who started out with the 49ers. San Francisco had been to the playoffs in each of the previous eight years under, first, Bill Walsh and now George Seifert, and that included three Super Bowl victories, most recently in 1988 and ’89. The 49ers reached the NFC Championship game in 1990 but were in a transition year. Most notably, the team lost 35-year-old star QB Joe Montana, who was out for the season with a torn elbow tendon in his throwing arm. Backup QB Steve Young was getting his chance, but the results had been uneven thus far and the Niners were also at 2-3. There were 57,343 fans in attendance at Candlestick Park on a sunny afternoon. The Falcons had the ball first and quickly went 73 yards in four plays. Chris Miller started off with a completion to Andre Rison for 39 yards to the San Francisco 34 and, following two carries by RB Erric Pegram, Miller fired long for WR Michael Haynes in the end zone and it was good for a 27-yard touchdown. Norm Johnson added the extra point. Steve Young (pictured at left) threw to Jerry Rice for a 15-yard pickup on the Niners’ first play from scrimmage, but RB Dexter Carter fumbled on the next one and SS Brian Jordan recovered for the Falcons at the San Francisco 49. Miller rolled out and threw to Haynes for a gain of 41 yards on first down and, three plays later, it was Miller to Rison for a seven-yard TD. Johnson’s point after put the visitors ahead by 14-0. The teams traded punts before FS Scott Case intercepted a Young pass at the San Francisco 38. The Falcons made their way to the San Francisco 12 as the opening period came to an end and, two plays into the second quarter, Johnson kicked a 29-yard field goal to make it a 17-0 contest. The 49ers responded by driving 72 yards in six plays. Young completed two passes to TE Jamie Williams for 16 and 15 yards and a long throw to WR Mike Sherrard picked up 31 yards to the Atlanta 10. FB Tom Rathman gained four yards up the middle and then Young, rolling to his left, ran for a six-yard touchdown. Mike Cofer converted to narrow Atlanta’s lead to 17-7. The Falcons reached midfield on their next series before punting and the 49ers had to punt from their own 25 in turn, with Joe Prokop’s deflected kick traveling only 17 yards to give the visitors good field position at the San Francisco 41. They reached the 23 at the two-minute warning and Johnson kicked a 43-yard field goal to put the Falcons up by 20-7. There was still time for the 49ers following Carter’s 34-yard kickoff return, and they advanced 66 yards in five plays. The big one was a long pass by Young that WR John Taylor caught for a 54-yard touchdown. Cofer’s extra point narrowed the Atlanta lead to 20-14 at halftime. San Francisco had the first possession of the third quarter and traveled 70 yards in five plays. Young ran twice for 14 yards and, while an apparent 20-yard completion to Taylor was called back due to an illegal motion penalty, a Young throw to Rice was good for a 57-yard TD. Atlanta’s Jordan blocked Cofer’s extra point attempt, but the game was now tied at 20-20. It didn’t stay tied for long when Deion Sanders gathered in the ensuing kickoff and returned it 100 yards for a touchdown. Johnson’s conversion put the Falcons back in front by seven points. The 49ers came back with a nine-play, 69-yard drive. Young completed four passes, most notably to Rice for 22 yards in a third-and-six situation and to Williams for 15 yards to the Atlanta 10. Two passes into the end zone fell incomplete but, following a defensive holding penalty, RB Harry Sydney swept around end to a five-yard TD. Cofer made the point after and the score was knotted once more at 27-27. The Falcons drove 80 yards in 10 plays in response. Miller had four completions along the way, connecting with WR Mike Pritchard for 15 yards and Rison and Haynes for 10 yards apiece. RB Steve Broussard ran for 10 yards on a draw play and an end run picked up 23 yards to set up a one-yard Miller to Rison touchdown pass. The extra point attempt failed when holder/punter Scott Fulhage fumbled the snap, but the visitors were again in the lead by 33-27. Carter returned the ensuing kickoff 39 yards to the San Francisco 49 and the Niners had the ball heading into the fourth quarter, putting together a 51-yard drive in eight plays. Young threw to Taylor for 20 yards and scrambled to a seven-yard touchdown, leaping into the end zone at the end. Cofer kicked the extra point and the 49ers had a one-point lead at 34-33 with 12 minutes to play. Once more the Falcons fought back, advancing 48 yards in six plays that resulted in a 44-yard Johnson field goal and a regained lead of 36-34. 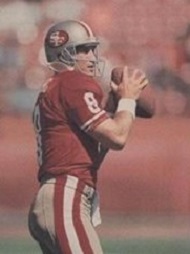 The 49ers methodically drove into Atlanta territory, but after reaching the 20 thanks to an 11-yard completion to Rice, Sydney lost nine yards when attempting to reverse field on a failed running play, an intentional grounding penalty moved the Niners back another 10 yards, and a third-and-29 pass by Young was intercepted by Tim McKyer (pictured above), the ex-49er. McKyer returned it 24 yards, cutting to the middle of the field, and then tossed a lateral to Sanders, who picked up another 13 yards to the San Francisco 35. Broussard, following a short gain, ran for 23 yards and while the Falcons couldn’t reach the end zone, they added a 30-yard field goal by Johnson to pad their lead to five points with 1:45 left on the clock. It was the icing on the cake. Young completed passes to Rice for 14 yards and WR Sanjay Beach for 20, but a desperate fourth down pass from his own 39 was intercepted by McKyer, his second of the fourth quarter, to seal the 39-34 win for Atlanta. The 49ers, playing catchup throughout the game, led in total yards (437 to 368) and first downs (24 to 19). However, San Francisco also turned the ball over four times, to none by the Falcons. Atlanta was also very effective running the ball, gaining 160 yards on the ground to San Francisco’s 94. Chris Miller completed 16 of 28 passes for 208 yards and three touchdowns, with no interceptions. Andre Rison had 6 catches for 69 yards and two TDs and Michael Haynes gained 94 yards on his five receptions that included a score. Steve Broussard rushed for 104 yards on just 10 attempts. For the 49ers, Steve Young was successful on 22 of 38 throws for 348 yards and two TDs, but also gave up three interceptions, and led the club in rushing with 68 yards on 11 carries that included two more touchdowns. Jerry Rice caught 7 passes for 138 yards and a TD and John Taylor contributed 80 yards on his three catches that also included a score. The Falcons lost to Phoenix the next week but then won seven of eight games, including the rematch with the 49ers, on the way to a 10-6 record. San Francisco won two, lost two, and was at 4-6 before putting together a six-game winning streak to finish the season also at 10-6. However, the sweep of the season series by Atlanta made the difference in which team went to the postseason. As a result, the Falcons attained second place in the NFC West and grabbed a Wild Card slot, beating New Orleans in the first round before succumbing to the Redskins at the Divisional level. The 49ers ended up in third place and out of the playoffs for the first time since 1982. Chris Miller passed for 3103 yards and a career-high 26 touchdowns and was selected to the Pro Bowl. Andre Rison also received Pro Bowl honors as he caught 81 passes for 976 yards (12.0 avg.) and 12 TDs and Michael Haynes led the NFL by averaging 22.4 yards-per-catch on his 50 receptions for 1122 yards that included 11 scores. 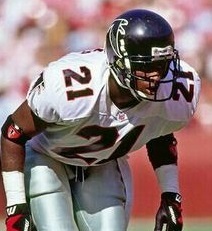 Deion Sanders (pictured at left) intercepted 6 passes, one of which was returned for a touchdown, and averaged 22.2 yards on 26 kickoff returns, with his return against the 49ers the lone TD, and 8.1 yards on 21 punt returns. He was chosen to the first of eight Pro Bowls in this, his third pro season. Things would get better for Steve Young, who led the league with a 101.8 passer rating, although he also missed time due to a knee injury. Jerry Rice had a typically outstanding year, catching 80 passes for 1207 yards and a NFL-leading 14 touchdowns.